This month’s blog post comes from Glenn Standish, DOS at IH Toruń. Thank you Glenn! It’s mid-term in a long, tiring but productive academic year. You’ve just finished writing the endless stream of reports, the parents meetings are planned and you as a teacher are starting to feel rather burnt out. To make matters worse, you open the coursebook and it’s another formulaic ‘write an email task’ or ‘write about your favourite hobby’. Your teenagers are probably feeling the same. Often we forget that they come to our school already after a barrage of other educational and curricular activities. Here in Poland, most of our teenagers have been awake since the crack of dawn and have been subjected to numerous other subjects, teachers and day to day issues. So should we be really surprised that they lack motivation or moan about doing a writing task, which let’s be honest is rather dull and formulaic on the surface. How can we motivate our teenagers to write? How can we give the task a sense of purpose? Why would a class full of tired and potentially demotivated students really want to write another coursebook task? One way that we’ve tried to combat this at International House Toruń is by launching a postcard exchange project. The concept is actually rather simple. Students write and send a postcard to likeminded students at another International House school somewhere in the world. It’s amazing how excited and interested the students genuinely are. Often they ask their teachers when the next batch of postcards will arrive and literally jump at the chance to write a response to their new-found friend. Of course the idea of pen-pal writing is nothing new. However, since the age of the internet the concept of snail-mail has sadly taken a back seat. This is rather unfortunate as it is so much more personal. It’s this fact coupled with the fun of receiving a real physical card that the students love the most. It also brings the coursebook writing tasks ‘alive’ and makes the activity a real-life scenario. How to set up a postcard exchange? Inform your DOS/academic manager/YL co-ordinator that you have a class wanting to write to another class abroad. Your DOS/academic manager/YL co-ordinator contacts other IH schools indicating the level and number of students. The easiest way to do this is for them to put a post up in the IH DOS or YL Facebook group. Once a similar class is found, you as the teacher can start the project by getting your students to write the initial postcard in class. In pairs brainstorm information and facts about the chosen country and write them up on the board as a spider graph. The teacher explains that they will be writing a postcard to a student in the other country. In pairs the students have to write 3 or 4 questions about the chosen country (e.g. Do you like tapas? Do you like flamenco dancing?). Brainstorm topics that interest the students (e.g. computer games, films, climbing, music). On their own they have to write 2 or 3 facts about themselves and 1 fact about the town where they live. The teacher then gives the students a postcard template for them to write their draft using the above information. 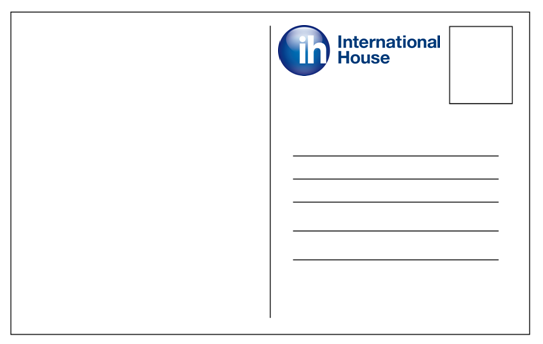 The student can begin the initial postcard with ‘Dear student’ or ‘Hi’. The teacher monitors and checks. Once checked, the student rewrites their draft in neat. This can either be on a real postcard from the town where they live or another template printed in card (for the student to then create their own cover). Once all the students have written their postcards, take a group photo of the class holding their cards. Print out the picture and number the students. On a separate piece of paper, create a list with the first names of the students (and ages) corresponding to the assigned number. Put all the postcards, photo and list into a plastic wallet and then send all the postcards in one batch to the school. Back to Blog of the IH Journal of Education and Development.